I spent quite a long time in helping them come to the knowledge of God. That's Pastor Aki writing about the Hindu people he just led to Christ. Pastor Aki leads the Evangelism in Nagaland project in India. I visited them again and again to make sure they understood God's plan for them. Since they all came to know the Lord personally, I have baptized them today. Praise the Lord for His amazing love! He has truly toughed the hearts of these people and brought them to Himself. After thorough confirmation about their salvation, I have baptized them! There were six of them. And there's no better place to baptize in this particular area than the river that rushes nearby. 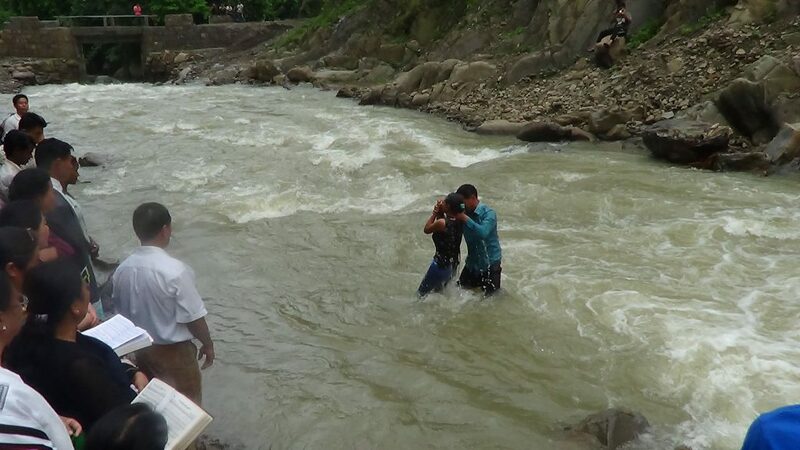 But when you baptize in a river, you sometimes have to be careful. The river was full and dirty after a long rain. And the water was rushing and high. But, trusting the Lord that He would make a way for him to baptize our new brothers in Christ, pastor Aki planned a baptism ceremony anyway. By God's grace, the rain stopped and the amount of water subsided. The water in the middle was still a rushing river, but it was manageable! Praise God for these former Hindu souls added to the Kingdom and for their family and friends to be able to witness their baptisms.